Payment plans : Please contact me directly to make arrangements. Fees include all materials. Please make checks out to Whistling Hawk Studio or Nancy McMillan. Your consistent attendance to the class you have registered is very important to your child and to the other members of the class. Plan to come to all classes. There are no make-ups for missed classes. If your child misses a class, I will provide you with the homework assignment for that week. For keyboard classes: if you would like to schedule a private make-up session, the rates are as follows: $37/ half hour; $52/ 45 minutes; $62/ hour. If the class must be cancelled because of weather or because I am ill, all registered participants will be notified by email or phone. For morning classes, if the public schools are cancelled there will be no class. Morning classes will be held if there is a delayed opening. For afternoon classes, if public schools are dismissed early there are no classes. If schools are closed for the day, I will decide by noon if afternoon classes will be held. The class will be made up at the end of the series of classes if there is time available (this is at the instructor’s discretion). All classes not made up by the instructor will be credited for the next series of classes only. If you wish to withdraw from class, refunds are only given after the second class and before the third class of the semester. You will be refunded for the balance of the classes. Materials cannot be returned or refunded. A late charge of $10.00 will be applied if tuition is not received by the first class. Returned checks are charged $25. Parental support and involvement in activities at home is key to the success of your child's music education. 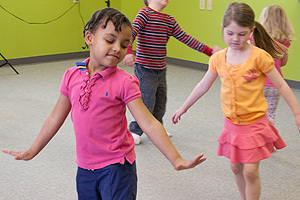 Musikgarten is about family music-making. 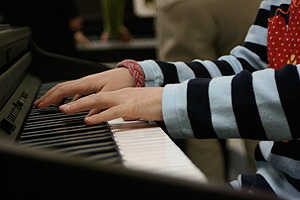 A regular routine will support the development of a love of music making in your children. Be creative in the ways you incorporate the Musikgarten materials into your life. Make a copy of the CD to have in the car. Pick a favorite song to sing while doing a chore with the children. Use one of the songs in the morning or evening for a wake-up or good-night song. Singing is a natural joy of childhood – and adulthood. Your child will follow your lead in this.